Now we have the odd group of the irregular verbs: the 르 irregular verbs. Unlike all other groups, these verbs are named after the verb stem’s last syllable. Unlike all other groups which are named after the verb’s final consonant, the 르 irregular verbs get their name from their final syllable which is ‘르’. This groups while different is actually a pretty straightforward irregular verb. You will understand how it works in no time. The first rule you need to know is, of course, when it becomes irregular. Like the ㅂ irregular verbs or ㄷ irregular verbs, this group of verbs show its true colors when you use a verb ending that starts with a vowel. When you add a verb ending starting with a vowel to a 르 irregular verb, the existing ㄹ moves to the syllable before the 르 syllable and the ㅡ transforms into another ㄹ that goes to the first verb ending syllable. That might sound a more complicated than it actually is. 모르다 + 아요 = 몰 + ㄹ + 아요 = 몰라요. 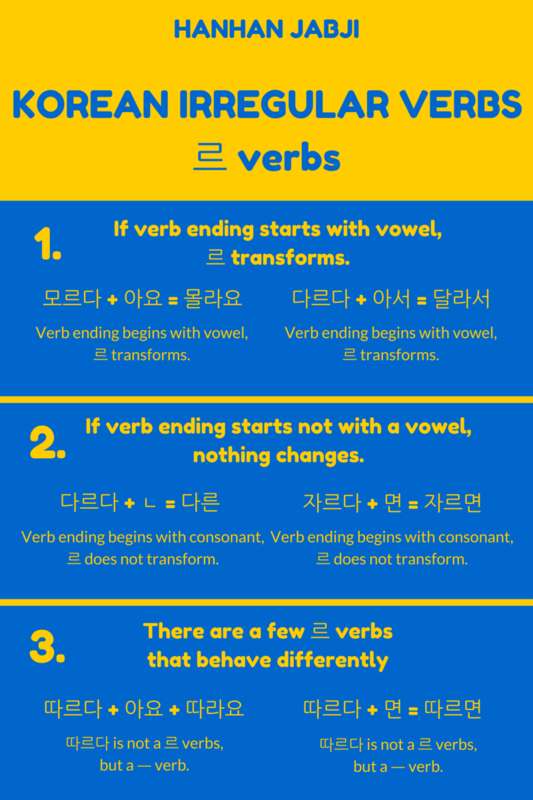 This is all there is to know about the 르 irregular verbs. As I said this group of verbs might be a bit different, they are also very straightforward. As always I selected a handful of useful 르 irregular verbs for myself to learn. Some of the verbs are pretty useful to know, especially one of them since it is also used in a few grammar structures. So it might be a good idea to at least know how that one verb works, no? The verbs I selected are: 다르다, 빠르다, 짜르다, 모르다, 부르다, 기르다, 서투르다, 마르다, 고르다, 누르다, 이르다 and 배가 부르다. You can learn these verbs with me using the Memrise course I made.